After the passing of hurricanes Ivan and Emily in 2004 and 2005 respectively, which destroyed a large percentage of our housing stock and the loss of major heritage buildings and sites, there was some enthusiasm to restore and where necessary rebuild, with the slogan “Build back better,” becoming the mantra of the day. To this end, the then government established the Agency for Reconstruction and Development (ARD) in 2006, and a special position was created for a Restoration Architect, which was filled by Dr. Trevor Holmes of the United Kingdom, through the good offices of the London based Commonwealth Secretariat. Dr. Holmes, to the best of the Sentinel’s knowledge — left Grenada in 2008 before the end of his two year contract, as he became frustrated at not being able to accomplish what he was contracted to achieve, that was, in the main — the restoration of the historic buildings of Grenada. As the Foundation was intimately involved, among others, in recommending Dr. Holmes as a suitable and capable candidate for the job at hand, the directors of the Foundation developed a close collaboration with him, in assisting in the process of restoring our damaged Heritage Buildings, especially the four churches — namely the R. C. Cathedral, the Anglican, the Methodist and Presbyterian, together with York House, the Governor-General’s residence and of course the Market Square complex. It was at this time that the Foundation launched the “FAITH WITH ACTION” project, aimed at mobilising funds to assist the four churches mentioned above with their restoration expenses. In this regard the main contributors must be recorded, namely: The St. George’s Rotary Club, the estate of the late Edward Kent, Sir Royston Hopkin, Columbian Emeralds and the Coyaba Beach Resort together with many other smaller contributors which amounted to about EC $85,000.00, which was distributed to the four churches, and for which the Foundation was most grateful. To date, the Methodist was the first to be restored in 2009 and the Cathedral followed in 2010. The Anglican and the Presbyterian are yet to be restored. In the case of York House and the Governor General’s residence, it was the expectation that the ARD would have been able, with the government’s support to mobilise external funding for their restoration. 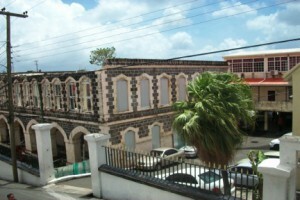 This of course has not been the case, and today in April 2013, York House and the GG’s residence and grounds have been left to the elements, and almost nine years on, nature is reclaiming these sites, as some of our prime heritage buildings and sites disappear from the Grenadian landscape, as significant components of our cultural heritage which are undocumented and are becoming a thing of the past. Sad to say the above scenario of neglect is continuing in the closure/abandonment/disregard for another major historic building, that of the NATIONAL PUBLIC LIBRARY on the Carenage. 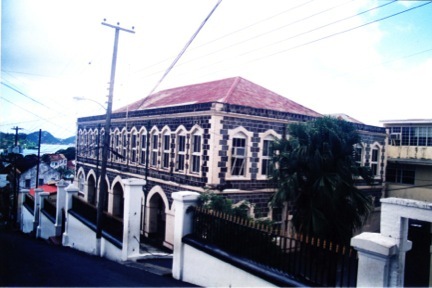 The State of Grenada is without a Public Library and there appear to be no interest in repairing this prime heritage building which houses most of Grenada’s history. This building has been vacated/abandoned for well over a year, and the Sentinel is reliably informed that all the print material – (books, magazines, catalogues, newsprint, and archived material) have been left in the closed building waiting to be carted away to the dump site or burnt, when they become unusable due to wet-rot caused from condensation, raindrops from the leaking roof and the remains left by rodents. Another site that is receiving some attention from the Sentinel is the Market Square, where the insensitiveness of the functionaries whose business it is to conserve our heritage, are doing their best to erase the significance of the site by using the open area of the square as a building site, by constructing “non-conforming” permanent structures in the open area. In the 40th year of our “political independence”, it is instructive that we ask ourselves, what development means. Are we “proud of our heritage”? As our national anthem admonishes; or are we satisfied with the insignificant material gains, and handouts — as the Grenadian persona becomes watered-down, as we grasp for the shadow while the substance eludes us.